Flies – Our fly patterns are on the cutting edge for Peacock Bass. We have been designing flies and testing them over 10 years for Peacock Bass. 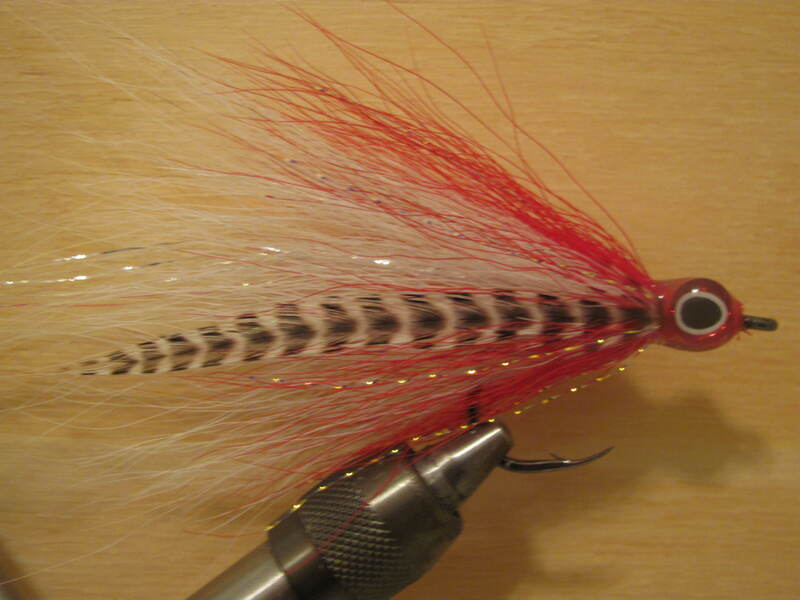 Our fly designers are well known in the industry for designing some of the most well known flies in the industry. Leaders – 40 lb fluorocarbon is a must for peacocks. These leaders are 6 feet in length, come with a perfection loop at the end and are tied on high quality Seaguar fluorocarbon. There are directions on the back of the package to show you how to tie a loop knot with 40 lb line. You can fish these leaders down to about 3-4 feet in length and then I would tie on a new one. Make sure you re-tie your flies on occasionally; these fish will wear out your knot even on 40 lb tippet. Rob’s Reducer – $10.00 Each. The most popular Peacock Bass fly on the market. First tied in 2003, it is now being commercially tied by Umpqua Feather Merchants in no less than a dozen sizes and colors. The buck tail is tied in backwards to give the fly a bigger profile. It pushes a ton of water and creates a lot of commotion. Fish this fly any time of day but for sure use it in the mornings when the larger peacocks are the most active. 1. Baby Peacock – The very first Reducer pattern. This fly will fish any time of day under any conditions. Once you catch a fish you will see why it is called Baby Peacock. Space Invader – $10.00 Each. Came on the scene 5 years ago with a bang. This fly is a little smaller than the Reducer and has a much smaller profile. It can also be fished anytime but is a really good fly to fish during the middle of the day when the sun is high and in clear water. I have seen many big fish caught with this fly and I like to use it when the action is hot. 1. Wright’s favorite – This little fly is a camp favorite . My fishing buddy Jim Wright is responsible for the name. Jim once caught 5 fish over 10 pounds in one day on this fly. This is a great fly! 2. Blood Bait – Say no more the colors kinda give it away. A great fly any time of day. It seems to really piss off the fish and they tend to really chase it aggressively. It is really good in clear water and around fish that are really active. 3. Little Jacunda – This fly can imitate many of the fish that Peacocks thrive on. The guides will reach for this fly out of your bag quite often. I personally like the flies with more yellow, orange and red in them but this fly is an important piece of the arsenal and will really fish well in the middle of the day and in clearer water. Bottom Dweller – $10.00 Each. This is a fast-sinking fly that is tied to ride hook up. This fly is my least favorite to cast. It is heavy and can wear you out if you try to fish it for any length of time. The conditions can change from year to year in the Amazon Jungle. If you are down there on a year when the water is a little high or is rising, then this fly can be important. If you get into a situation where you want to fish deeper then this is your fly. It is more of a situational fly and one you will want to use sparingly in deeper places. 1. Baby Peacock – Great colors and may be my favorite of the Bottom Dwellers.